Posted on Fri, Jan 25, 2013 : 5:59 p.m. Firefighters battle the blaze at 401 S. Division in Ann Arbor Friday evening. 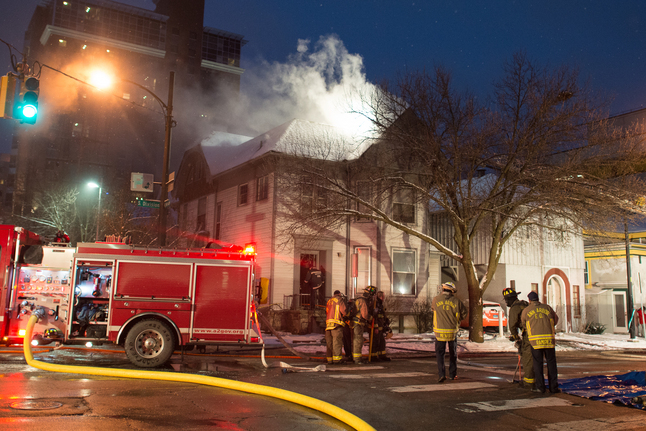 Smoke poured from a house in downtown Ann Arbor Friday evening as fire engines rushed to the scene. The fire, which broke out shortly before 6 p.m., started in the basement, Ann Arbor Fire Chief Chuck Hubbard said. “(It) worked its way up the walls and got up into the attic,” he said. As of 6:15 p.m., firefighters were still working to get it under control, though no flames were visible. There were no reported injuries. Two dogs were reportedly rescued from the building. The house is broken up into five apartment units, one in the basement, two on the main floor and two on the upper level. Seven tenants live in the building total. Firefighters had closed Division Street between Jefferson Street and William Street as they fought the fire.